Can Sri Lanka capitalise out of its strategic location in the Indian Ocean region? Today there is growing importance of oceans for trade and commerce. While acknowledging the strategic position of the island in the Indian Ocean Region, small states such as Sri Lanka have to be aware of the geopolitical implications resulting in complications that require foreign policy adjustments, writes Natasha Fernando. Today there is growing importance of oceans for trade and commerce. The Indian Ocean is the world’s third-largest body of water with 50% of trade traversing the region covering approximately 20% of the water on the Earth’s surface. Due to existence of power rivalries and wars, the oceans are now prone to conflict. Some examples are: the conflict over Suez Canal, Strait of Hormuz, Pirate and terrorist activity, South China Sea disputes etc. Sri Lanka, a small island state is strategically located among the most important sea lanes of communication. The US Senate’s Foreign Relations Committee on Sri Lanka states that “Sri Lanka’s strategic importance to the United States, China and India is viewed by some as a key piece in a larger geopolitical dynamic”. As a country that emerged from a civil war facing human rights allegations; the domestic politics and international relations are heavily geopolitical with foreign powers having vested interests. Sri Lanka’s location in the Indian Ocean region as an island State has been of strategic geopolitical relevance to several major powers. Sri Lanka was colonised by Portuguese, Dutch and the British to be used as a transit hub for trading goods. These powers also used Sri Lankan ports for docking and refuelling their ships which were navigating their vast empires. Some examples that highlight Western interests in Sri Lanka’s strategic location are the British Defence and External affairs Agreement of 1948, and the Maritime Agreement with USSR of 1962 during the Sirimao Bandaranike administration. Even during the J.R Jayewardene (1978-1989) and Ranasinghe Premadasa (1989-1993) tenures, Sri Lanka was chosen to build the Voice of America transmitting station [suspected of being used for intelligence gathering purposes and electronic surveillance of the Indian Ocean]. Sri Lanka has a list of highly strategic ports located among busiest sea lanes of communication. The Lloyds list state Sri Lanka’s Colombo Port is the 25th busiest container port in the world. The Sri Lanka Ports Authority reports, it made profits of 11 billion rupees in 2016 while recording revenue of 44 billion rupees. The natural deep water harbor at Trincomalee is the fifth largest natural harbour in the world. Nissanka states port city of Trincomalee was the main base for Eastern Fleet and British Royal Navy during the Second World War. Sri Lanka’s location can thus serve both commercial and industrial purposes and be used as a military base. A container ship at Hambantota port. Photo credit: Deneth17, Wikimedia Commons, CC BY-SA 3.0. Balancing interests and external pressures Kaplan in “Asia’s Cauldron” opines that Indian Ocean region is ‘geared to be the century’s most intense point of conflict’. This exerts pressure on Sri Lanka, a small state to either accede to external demands, or stay neutral. Therefore Sri Lanka will face challenges in maintaining her sovereignty and also foreign policy of non-alignment. 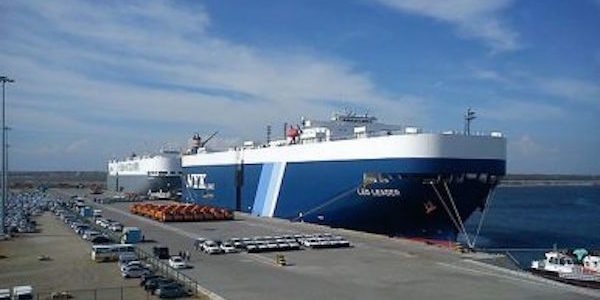 It is generally argued that the policy of non-alignment was compromised during the Rajapaksa administration which leaned heavily on China for economic and diplomatic support. Senaratne suggests learning to capitalise from balancing the interests of the most important regional and extra-regional powers [China, India, and USA] could harness Sri Lanka’s potential. Notwithstanding, the seas are highly important for the development of Island states such as Sri Lanka to participate in global trade of goods and commercial activity. It has been argued by scholars that acceding to foreign demands can change international voting behaviour in favour of Sri Lanka in which case balancing geopolitical interests should be at the centre of Sri Lanka’s foreign policy strategy. Nissanka has pointed out during the Premadasa tenure, following peak of LTTE terrorist activity and JVP insurrections; allowing voice of America to continue its operations in Sri Lanka lessoned international pressures. China and Russia have been constant Sri Lankan allies who had expressed willingness to veto any UN-sponsored resolution probing into international intervention into Sri Lanka’s Human Rights issue. Sri Lankan government has been constantly evading foreign direct intervention to Sri Lankan civil war especially during final stages of the war on grounds of sovereignty. It has been argued that China (a veto power) was a necessity to evade human rights allegations and Chinese involvement was warmly accommodated by the government. Today China’s involvement cannot easily be diluted; China subtly displays aggression towards other extra territorial power gaining more diplomatic footprint in Sri Lanka. One such example was the docking of Chinese warship in Colombo port in 2014 during the visit of Japanese Prime minister Shinzo Abe. There is also Chinese-Indian rivalry to gain diplomatic footprint post 2015 evident by increased Indian-Sri Lankan concurrences. While acknowledging the strategic position of the island in the Indian Ocean Region, small states such as Sri Lanka have to be aware of the geopolitical implications resulting in complications that require foreign policy adjustments. One such adjustment is to neutralise China by increasing diplomatic gain from Japan, USA and India. Although non-alignment proved useful during the Cold War period, and remains relevant today, Sri Lanka cannot follow this policy to precision. Amidst international probes into human rights allegations; it is important uphold the country’s sovereignty and territorial integrity. This could be done through effective public diplomacy, more track one diplomatic engagements with other Asian counterparts and playing a better role in regional organisations could harness Sri Lanka’s potential. Perhaps someday Sri Lanka could aspire to be a neutral venue catering to high level diplomatic engagement as was the recent case of the Trump-Kim summit held in Singapore. This article gives the views of the authors, and not the position of the South Asia @ LSE blog, nor of the London School of Economics or the stance of INSSSL or the government of Sri Lanka. Please read our comments policy before posting. Natasha Fernando is a research assistant at the Institute for National Security Studies Sri Lanka. She holds a BA from Kelaniya, Sri Lanka.